Winter is the perfect time for laser treatments. The weather is cooler and the sun is not so bright, plus who doesn’t want to start the new year with better skin! At Dermatology & Laser of Del Mar, we are combining the power of Fraxel laser skin resurfacing with the healing and rejuvenating effects of platelet rich plasma (PRP). The synergistic effect of these two treatment powerhouses creates unparalleled rejuvenation that improves skin texture, tone and stimulates collagen and elastin production. This gives natural, long-lasting results, with less downtime than ever before. We couldn’t think of a better pair! Fraxel Re:Pair 600 Micron laser has long been the gold standard in laser skin resurfacing. Fraxel uses laser energy create micro channels deep in the skin, similar to pixels on a TV screen. These micro channels are interpreted by the skin as injuries. This stimulates a healing cascade to repair the damage by replacing old, tired skin cells with fresh, healthy cells. This process also triggers additional collagen and elastin production to encourage this recovery process. Fraxel laser not only provides an incredible cosmetic benefit to your skin, it is also recognized for its ability to treat actinic keratosis (pre-skin cancers) and improve your skin’s health. Platelet Rich Plasma (PRP) harnesses the healing powers of your own blood to stimulate collagen production and encourages the regeneration of cells to rejuvenate the skin. PRP rejuvenates the appearance of your skin. When used in conjunction with Fraxel laser resurfacing patients see an even greater treatment result than with only one modality. By introducing your body’s own platelet rich plasma into the skin after resurfacing, the production of collagen and elastin is “jump-started” and the natural healing properties of the PRP reduce your healing time. The treatment area is cleansed and a topical numbing agent is applied. This is to decrease any discomfort during the procedure. A small amount of blood is drawn from your arm, similar to when you are having medical lab tests completed. While you’re having your laser treatment, your blood is prepared to be re-introduced to your skin. 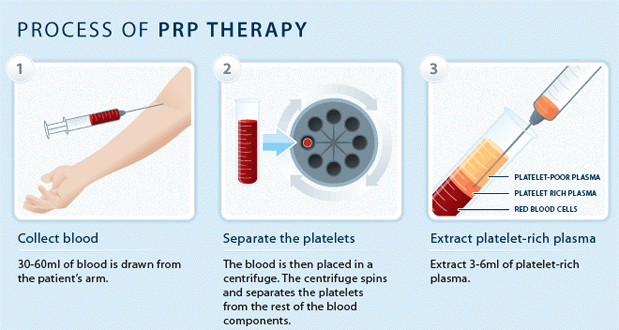 This is done by separating the working platelets from the red blood cells and creating platelet rich plasma (PRP). The Fraxel Re:Pair 600 micron laser passes over your skin, and the beams create microscopic wounds through the epidermis into the dermis level of your skin. While these micro channels or ‘holes’ from the laser are still fresh, the platelet-rich plasma is applied topically and massaged into the skin. The natural healing platelets contained in the PRP enter the channels created from the laser, effectively allowing for deeper delivery of the PRP. Typically with your Fraxel Re:Pair 600 micron treatment you will experience minimal downtime – usually some redness and mild swelling for three to five days. Due to the natural healing platelets contained in the PRP delivered immediately after your laser treatment, you may find your healing time accelerated. While the face, neck, chest and hands are the most common and popular treatment areas for Fraxel Re:pair 600 micron with PRP, it can be performed on other body areas. Watch your skin gradually improve over the following months and experience long-lasting results! For more information about Fraxel Re:Pair 600 micron with PRP, or to schedule your consultation, contact us.